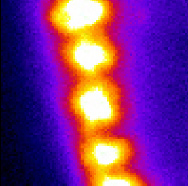 Excitons self organize into an ordered array that looks like a miniature pearl necklace. A newly published paper details the findings made by physicists while measuring the coherence and spin of excitons in a refrigerated system. The team discovered that polarization measurements showed that there was a strong correlation between the coherence and polarization. Physicists at the University of California, San Diego have discovered patterns which underlie the properties of a new state of matter. In a paper published in the March 29 issue of the journal Nature, the scientists describe the emergence of “spontaneous coherence,” “spin textures” and “phase singularities” when excitons—the bound pairs of electrons and holes that determine the optical properties of semiconductors and enable them to function as novel optoelectronic devices—are cooled to near absolute zero. This cooling leads to the spontaneous production of a new coherent state of matter which the physicists were finally able to measure in great detail in their basement laboratory at UC San Diego at a temperature of only one-tenth of a degree above absolute zero. The discovery of the phenomena that underlie the formation of spontaneous coherence of excitons is certain to produce a better scientific understanding of this new state of matter. It will also add new insights into the quirky quantum properties of matter and, in time, lead to the development of novel computing devices and other commercial applications in the field of optoelectronics where understanding of basic properties of light and matter is needed. The research team was headed by Leonid Butov, a professor of physics at UC San Diego who in 2002 discovered that excitons, when made sufficiently cold, tend to self-organize into an ordered array of microscopic droplets, like a miniature pearl necklace. Using a state of the art refrigeration system, the UC San Diego physicists were able to achieve temperatures ten times colder than that earlier effort, enabling them with an instrument called an interferometer to measure coherence and spin of each pearl or bead within this necklace. What they discovered was that the exciton particles’ spin is not homogenous in space, but forms patterns around these beads, which they call “spin textures.” They also discovered that a pattern of spontaneous coherence is correlated with a pattern of spin polarization and with phase singularities in the coherent exciton gas. The physicists discovered a correlation between the coherence (at left) and spin polarization (at right) of the excitons. The physicists created the excitons by shining a laser on cooled samples of gallium arsenide, the same semiconducting material used to make transistors in cell phones. The force of electric attraction keeps these two objects close together, like an electron and proton in a hydrogen atom. It also enables the exciton to exist as a single particle rather than a non-interacting electron and hole. However, since the electron and hole remain in close proximity, they sometimes annihilate one another in a flash of light, similar to annihilation of matter and antimatter. To control this annihilation, Butov and his team separate electrons and their holes in different nano-sized structures called quantum wells. This allows creation of excitons with the required lifetime, about 50 nanoseconds in the experiment. In their experiments, the physicists sent that emission through a complex set of mirrors called an interferometer, which divides the light into two different paths. This allowed them to compare two spatially separated regions of the same sample, enabling them to see the fine details of spontaneous coherence in excitons that had never been seen before. Other members of the research team were UC San Diego graduate students Jason Leonard and Aaron Hammack; Michael Fogler, associate professor of physics at UC San Diego; Alexey Kavokin of the University of Southampton; and Arthur Gossard and Ken Campman of UC Santa Barbara’s materials science department. The research project was supported by grants from the US. Department of Energy, National Science Foundation and U.S. Army Research Office. Be the first to comment on "Cooling of Excitons Leads to a New State of Matter"